Imagine the scenario where you have a monster gaming PC, but you also use the same area to support a few internet connected consoles. Or that the Wi-Fi router for the environment doesn’t actually reach that far, and the home could help assist with wider coverage. Rivet Networks, the company behind the Killer networking chips (originally Bigfoot, before being acquired by Qualcomm then spun back out again), is offering OEMs another plus point in their product functionality by offering such a solution. 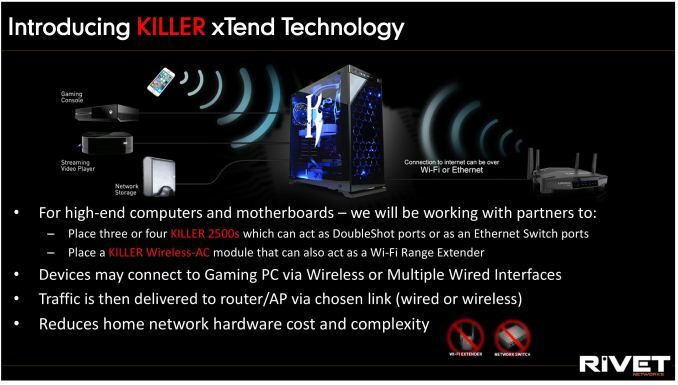 The concept is this: if a system has three network ports and/or Wi-Fi, and all the ports are Killer based (E2500 for NICs, Killer AC1535 for Wi-Fi), then Rivet will provide a license to use the new xTend software. This allows a user to run the PC in one part of the house, and forgo the $25 cost of an unmanaged network switch or $50 for a Wi-Fi extender by giving it on the motherboard. My personal example use case is the one above: having one cable from the home router to the main PC, which is then hooked up to consoles and a NAS – rather than one cable per device all going back to a router or having an extra couple of cables for a switch. Rivet’s argument here is that, for the high-end systems at least, adding a couple of network ports is relatively cheap (think ~$1 each), and given the flexibility with Intel chipsets in the Z270 platform and newer, a good gaming board should easily be able to accommodate. The implementation can use the Wi-Fi card (if one is present) to both connect to the home router and be used as an access point in one by time-slicing between the two. Recently the Killer software has been updated to a new UI, so if anyone uses the old Qualcomm UI then it’s worth checking out the new one (if only because I gave some small direction in the design). 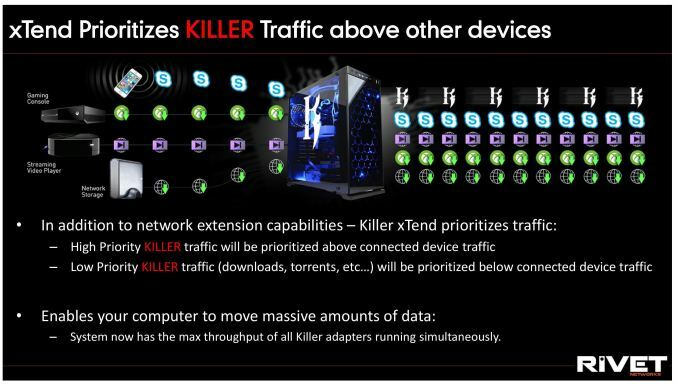 xTend will be built into this new UI, along with the standard priority settings that the Killer ecosystem allows for different traffic types. Nominally the Killer software offers six levels of priority, with the default being priority 4. All mass download / update systems get the lowest priority (six), while VOIP sits at the top, followed by gaming. With this xTend feature, all traffic going from other devices through the main PC will be classified as priority 4, although this may change (offering per-device configuration) in future software revisions. Killer xTend was accidentally (?) announced with the launch of MSI’s new Z270 Godlike Gaming motherboard, which uses three E2500 network ports and the Killer 1535 Wi-Fi module. We are told to expect it to appear on other MSI products, as well as an implementation slightly different from GIGABYTE by way of a bundled PCIe card featuring up to 3 additional network ports. It would be interesting to see a PC with several of those cards included, for a home-made 24-port Killer switch.